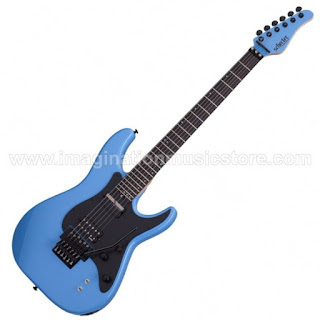 The Schecter Sun Valley SS FR-S solidbody electric guitar is a great choice for players looking for a guitar that pushes their technical limits while boasting the features and design to keep up with their every note. The guitar's classic styling recalls some of the best super-style instruments in history. And while an EMG Retro Active humbucking pickup delivers active clarity and passive dynamics, the neck position Sustainiac pickup offers three voices of unending tone. Also, the Schecter Sun Valley SS FR-S's exclusive Hot Rod Floyd Rose tremolo offers precise tuning and pitch control. Inspired by souped-up and highly modified rock guitars, the Schecter Sun Valley SS FR-S solidbody electric guitar exudes a no-nonsense, high-performance attitude. Its black pickguard, hardware, and electronics sit on a comfortable S-style mahogany body. A bolt-on hard rock maple neck features a fast Thin-C neck contour and a 24-fret, 14" radius fretboard. And the Sun Valley SS FR-S's neck heel is beautifully contoured, allowing unrestricted access to the guitar's highest frets. Schecter tapped EMG Pickups and the Sustainiac company to supply the Sun Valley SS FR-S's horsepower. EMG's Retro Active humbucker utilizes a specially designed active preamp system and passive-style coils for a tone that boasts vintage clarity with modern power. The neck-position Sustainiac humbucking pickup effortlessly delivers infinite sustain and thick feedback with a flip of a switch. And a simple-to-use 2-knob control layout works in conjunction with the 3-way blade switch to access a wide variety of tones. Schecter and Floyd rose have partnered to bring you the Floyd Rose Hot Rod double-locking tremolo for a new level of control and stability. Floyd Rose has long been one of the best double-locking tremolo sellers at Sweetwater. And the Hot Rod is a specialized take on their iconic design that you will only find on select Schecter guitars. The addition of this trem is another appointment that prepares the Sun Valley SS FR-S solidbody electric guitar for your best playing.